Since the release of the iPhone 8 Plus, it has been loved by people. It has changed the design of the past, using the glass design, making the iPhone 8 Plus more fragile, falling from a foot high, it will break the screen and the glass back shell, and its maintenance costs are very high, in order to protect your iphone, be sure to buy the iPhone 8 Plus case, today we introduce a functional protective case – wallet case. If you like retro design, CaseMe Case can easily attract your attention. The CaseMe iPhone 8 Plus Wallet Case is crafted from premium PU leather. Provide the necessary protection for your equipment to prevent falls and scratches. The magnetic clasp allows you to secure the case perfectly. 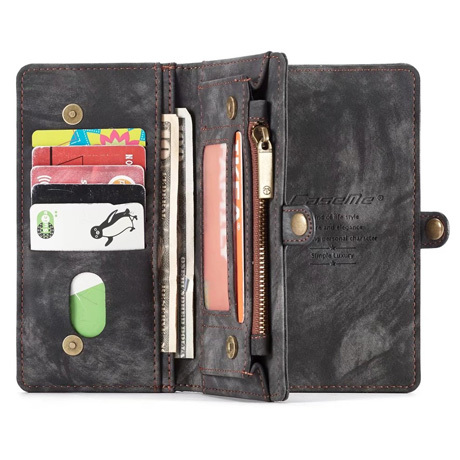 It has 14 card slots and a zipper wallet that is sufficient for your basic needs. If you like zipper design, check out the BRG iPhone 8 Plus zipper Wallet Case, which is the true wallet case compared to the CaseMe wallet case.